The 64th Nagoya Festival will be held Oct 21-22. Beginning in 1955, it is the largest festival celebrating the fall season in Nagoya. The festival’s highlight is its multiple parades, one of which will be 600-people strong, celebrating the lives of Japan’s most famous feudal lords. With the festival spread out over the city, this is a great opportunity to experience Japan’s third largest city. The biggest draw for many attendees will be the numerous parades. There will be two traditional parades during the weekend, the first consisting of a number of huge floats, upon which performances will be conducted. The other consists of a parade of eight Kagura Yakata. Traditional Japanese music will be played alongside these float-like structures, which are ornately decorated in gold. They are also designated as a local cultural property. In addition, there will be a handful of other parades which celebrate the modern aspects of Nagoya. With a children’s parade, a parade celebrating the ties with Nagoya’s sister cities, a sports parade and more, there’s more than enough to see. Nagoya was where the three most influential feudal lords in Japanese history were based: Nobunaga Oda, Toyotomi Hideyoshi and Ieyasu Tokugawa. To celebrate the lives of these three men who helped to shape Japan’s future, there will be a special parade dedicated to them made up of around 600 participants. Intricately planned out onto a number of stages, the parade will consist of a flute-whistling children’s group and an autumn leaf-adorned group led by a shachi-bearing car, before the three feudal lords make their appearances. Actors playing Oda, Hideyoshi and Tokugawa will appear, as well as actresses playing three important female figures, Nohime, Nene, and Senhime, in this huge parade. Nagoya has a number of other attractions available for those who want to escape from all the parades. Visit the Noritake Forest (a maker of Western cutlery), the Toyota Commemorative Museum of Industry and Technology, and LEGOLAND Japan. 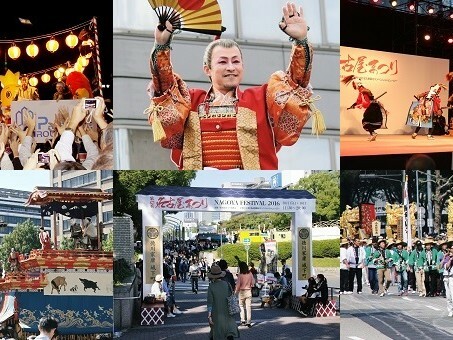 For a taste of Nagoya’s past and present, head down to Nagoya Festival.